The Crooked Banana: Make a List... Tuesday? It was a quiet weekend on my little blog. I took a little break from sewing after the whirlwind of finishing my sister's quilt. I was a tad obsessed with it and pretty much spent every hour I wasn't working or eating or watching a movie with the boyfriend (I couldn't neglect him completely...) with that quilt. No regrets! It turned out great and my sister loved it :) She just got a new job, too, so I decided I was justified in giving it to her 6 weeks before her birthday. After that I needed a break. I was also scheduled to work Saturday, so that was part of it. But then that afternoon I got a job offer from the place I REALLY wanted to work, so the rest of the weekend was spent celebrating. And, you know, booking a hotel room in Vegas since I won't be working this weekend anymore. It wasn't a total whim! Some of my old coworkers have been planning a reunion in Vegas and I soooo wanted to go. And I thought I would be able to when I finally got a job except then I got scheduled for Saturdays! But now I've left that position and have another couple of weeks off, so I decided to splurge and just GO. I can't tell you how excited I am! I haven't seen most of these people in almost a year... some much longer than that. We all worked together as undergrads. They were like my family. SO EXCITED. It is going to be legendary. Yeah! 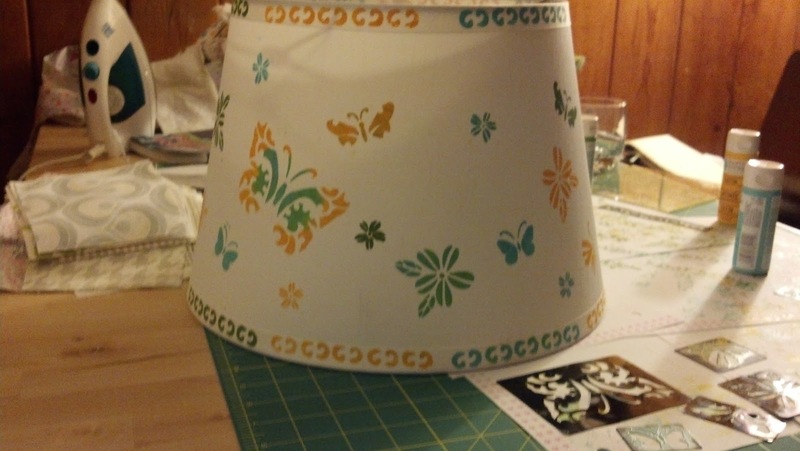 Painted lamp shades. I was originally planning to cover them in fabric, but then I saw this idea on Pinterest and decided to go for it. I love how it turned out :) The other one is not quite finished yet. Hopefully I can get to that this week and show you the finished lamps! Oh, man. 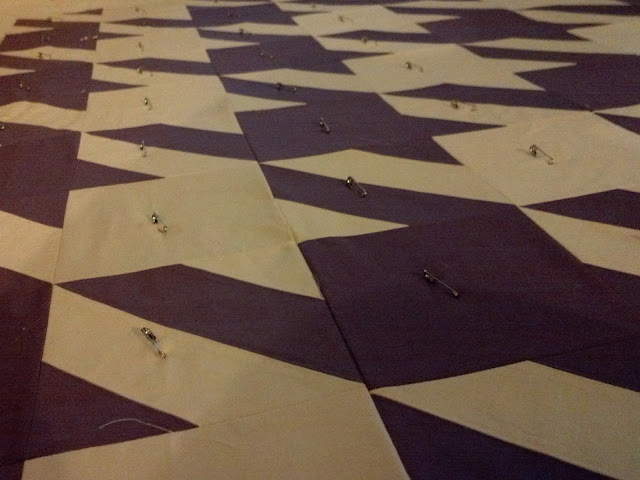 Basting a queen sized quilt was a HUGE job. My fingers still hurt! I had to move most of the furniture out of the living room to do it. But it's done and basted and I've already started the quilting! YAY! The quilting is definitely going to take a while. That quilt it heavy. My shoulders get tired just thinking about it. But it's going to be so worth it when it's done... Just have to keep my mind on how pretty it will look all laid out on my bed! Quilting this has already taught me one thing. Before I get back to quilting, though, I need to organize my thoughts. There are so many things I want to do and make! I feel like I need to write it all down so I can get a handle on all my ideas and plan what to do next. WOW. Okay, I want to do more things than I thought. And I will probably think of more. But at least I got them out of my head for now. I don't think I will be able to do all of this list in a month! Maybe they should be more long term goals? Ah, well. We'll see how I do. And now, back to sewing! Linking up to Show and Tell Tuesday with Randi at i have to say... and WiP Wednesday with Lee at Freshly Pieced, hosted by Claire from Sewing Over Pins this week! :) Have a great week! Looks like a great list of goals to me! Never a mistake to have a ton of ideas floating should a project be done quicker than expected. Have a great time in Vegas with your friends. Congrats on the job offer! I love the color of your houndstooth quilt. I made a black/white one but I can't decide how to quilt it...I'm anxious to see what you do on yours. Good luck! Congratulations on the new job! I would say a celebration is in order and what better way to celebrate than to spend it with people you love! I'm impressed by your lampshade! I hadn't thought of that, but I like the way yours turned out. The gigantic quilt looks like a labor of love that will be beautiful when finished! That's a lot of work and I like variagated thread too! Congrats on a new job....and your quilt looks amazing. 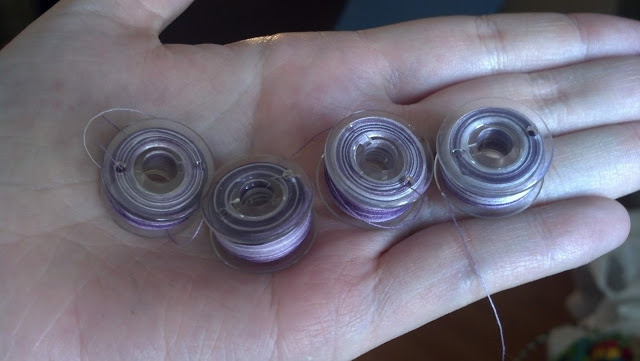 I guess I've never used variegated thread, but I should look into it. Visiting from Show & Tell! Happy Tuesday! Ooooh! I cant wait to see that hounds tooth all quilted up! I admire your list of goals and look forward to seeing all of your progress. Your houndstooth quilt is looking lovely! Love the houndstooth. That one is on my list too.